Pomeroy Green in Santa Clara, early 1960s. At Pomeroy Green, Ken Kratz with wife Diane Harrison look forward to the National Register: "It’s a good program," he says. "Eichlers are important." 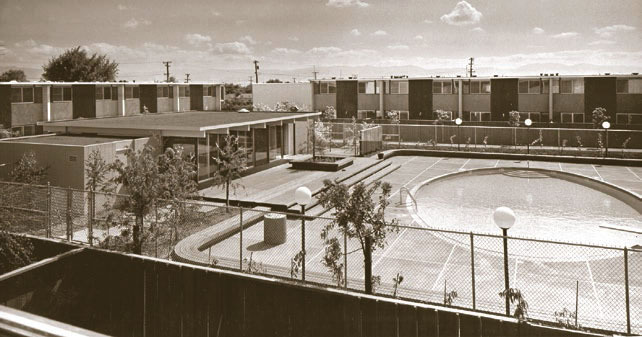 Like the folks in Orange, some people in an Eichler condo complex in Santa Clara, Pomeroy Green, were waiting and watching until their neighborhood turned 50—and then they moved towards historic designation. "We were built in 1963," Ken Kratz says, "and the day before we became 50 years old [in 2013] I was on it." But five years later, Pomeroy Green, with 138 units in a grouping of buildings surrounded by parks and walkways, is still not on the National Register. And efforts to use its potential historic status to stave off a proposed new residential complex that residents fear would loom over their homes have failed. So far. A suit has been filed to overturn city approval of the project. Because Pomeroy Green is a cooperatively owned townhouse community, residents don't have to fear that individual owners will do exterior changes. But they do have to worry about developments next door to their complex. Kratz says a group of Pomeroy residents has been both fighting the proposed housing and working to secure Register approval. He has been working closely with state preservation officials and expects to have the nomination complete soon. Kratz says the Pomeroy Eichler Neighborhood Preservation Society didn't decide to seek National Register status to head off the proposed development. The timing was coincidental. 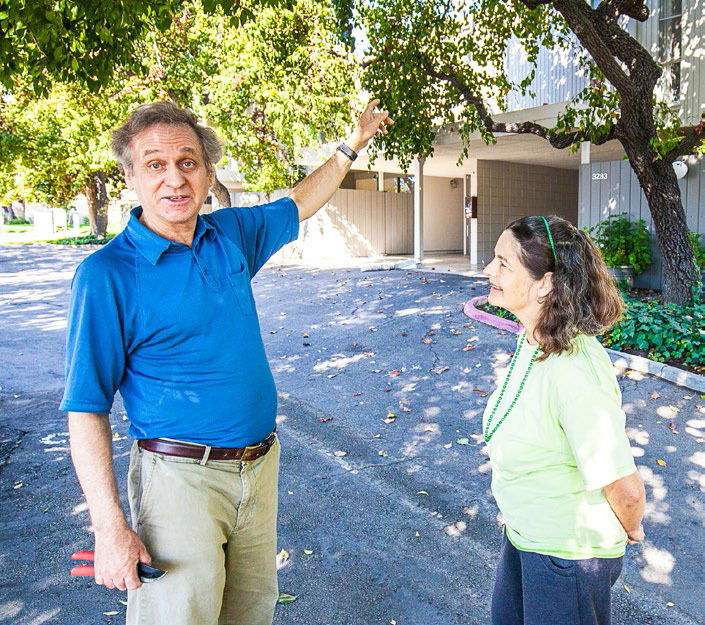 Pomeroy Green is likely to be the third Eichler neighborhood to be placed on the National Register—more than a decade after Palo Alto's Greenmeadow and Green Gables were named in 2005. Is it time for your neighborhood to seek protection from monster homes, two-story additions, or remodels that no longer look like Eichlers? First, figure out what you're after. Is securing backyard privacy the main thing? Then see if your city has a mechanism for banning homes over a certain height. It doesn't? Ask the council to create one. Or would you rather go further and preserve the neighborhood's architectural and historical character? Does your tract have CC&Rs (Covenants, Codes & Restrictions)? If they have fallen out of use, maybe you could revive them. Working with the city to create enforceable design guidelines is another strategy. This could be done by creating a historic district or an 'Eichler overlay' district. How tough would you like these rules to be? Voluntary suggestions? Mandatory rules? A little of both? And who would enforce them? A neighborhood committee? Or a city or county planning department or historical resources commission? Daniel Hillmer advises checking with city planning staff to see what rules exist. Look into your city's general plan and the process for updating it. It's important to get many neighborhood people involved so others will buy into the idea. Work to dispel fears, for example, that homeowners will be required to undo past changes, such as replacing doors that don't fit Eichler style, or that rules will prevent them from making interior changes. "You have to repeat, early and often, 'It is not retroactive.' And you have to repeat that again. 'It is not retroactive,'" Ettinger says. "Whatever condition your house is now, it can stay that way. 'It is not retroactive.'" If people complain that designation or zoning changes would reduce property values, speak to people in other Eichler neighborhoods that actually have such rules or designations in place—and, incidentally, also have some of the highest home values in the state. In Orange, a long planning process, led by the architectural firm Page & Turnbull, pulled many neighbors into community meetings and workshops. Tracy Ettinger says that strategy proved successful in determining what kinds of regulations would be acceptable to the community. "Getting the city's attention is important, because [the process is] expensive," Ettinger says. "If the city hadn't hired Page & Turnbull, the grassroots [homeowner support] would have had to pay for it." Pomeroy Green's Ken Kratz says Eichler owners really should consider the National Register. "I'd advise them to get together with their neighbors, review the state [of California's Office of Historic Preservation] requirements, and go for it," Kratz says. "I think it's worthwhile. It's a good program. Eichlers are important."